This morning I met Goody at the Salt Lake Sports Complex to swim the USMS 5K Postal. He was my timer / lap counter and then Gords came to be Goody's timer / lap counter so that I could get to work on time. 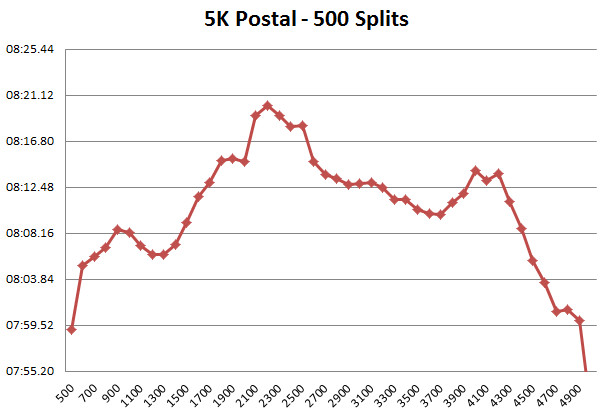 For those not familiar with the 5K Postal event, it is a 5000 meter swim for time. A timer / lap counter records your splits and final time and you submit the results online. USMS has a series of five postal swims (1 hour, 5K, 10K, 3000 yard, and 6000 yard) throughout the year. It has been a goal of mine to complete all five postal swims this year. I was in the indoor pool at 5:30am and warmed up for about 45 minutes. While I was warming up, Goody got set up outside so that we could start right at 6am. I had been sipping on some Perpetuem all morning and ate a Buzz Bite right before starting the 5K. I wasn't planning on taking any other feeds and just swimming straight through the 5K. I felt pretty good the whole way. I thought about stopping to take a drink and fix my leaking goggles between the 3000 and 3500 meters, but decided to just plow through. Goody did a good job letting me know where I was by walking up and down the deck every 1000 meters. At about 3500 meters, I though I should start trying to pick it up a little bit. The last 500 meters I was swimming pretty hard with the last 100 meters as fast as I could. I'm not really sure how to pace a 5K. I have been working up to the 11-mile Dam 2 Dam swim last weekend and all my pacing work was based on an 11-mile pace. In hindsight, I could have pushed a little harder on the 5K, especially between about 1200 and 2200 meters. I was shooting for between 1:20 and 1:25 and finished at 1:21:24.19. Not bad. I think next year I will shoot for under 1:20. 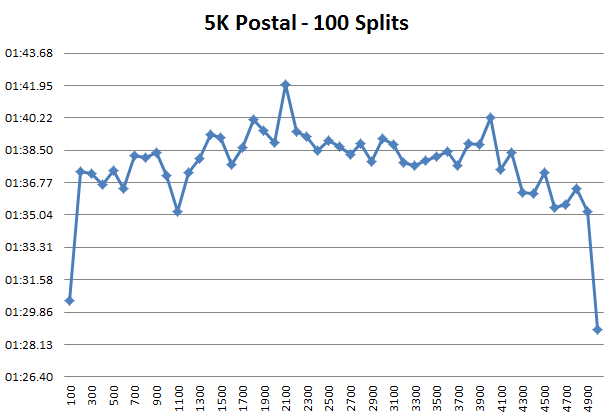 One of the funnest parts of postal swims for me is looking at the data afterwards. You have to record your splits anyway, so you may as well analyze them. I'm happy with my overall pace (I will push it harder next year though). My slowest splits were right around the 1400 to 2500 meter marks. Now that I know this, the next time I swim a 5K postal, I will make an effort to stay strong during that part of the swim. I have mixed feelings about my fastest splits being at the end of the swim. On one hand, I'm glad I could finish strong. On the other had, it means I probably could have pushed harder earlier on in the swim. This all makes me wonder what the ideal racing strategy is for this event. Go out easy and negative split each 500 or 1000 meters? Go our hard, level off and finish hard? Go out hard and try to hang on to the end? Try to swim right at your goal pace the entire time? Anyway, I'm happy with the swim overall. If nothing else, it gives me some things to think about and some insight into where I am weak in my pacing. 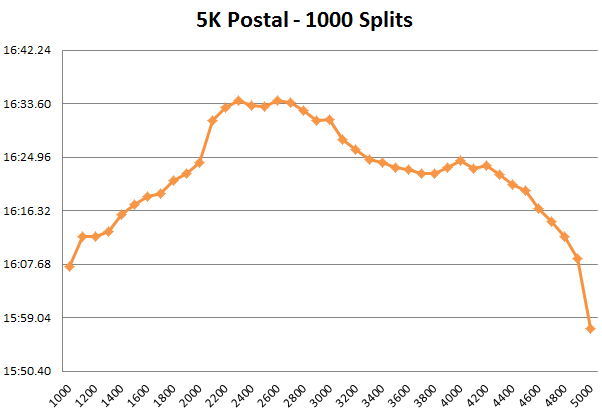 Next up is the 10K Postal.